Find your way around campus with the WUSTL map mobile app. The app provides you with a list of buildings and offices on the WUSTL Danforth and Medical Campuses and quickly pinpoints them on a map. Also see WUSTL Medical Campus Map with parking indicated. Farrell Learning & Teaching Center (FLTC) is located at 520 South Euclid Avenue. Bauer Hall is on the north side of Danforth Campus on Throop Drive, and is accessible from the University City-Big Bend MetroLink Station, located at the intersection of Big Bend Boulevard and Forest Park Parkway. From the station, head away from Forest Park Parkway towards Snow Way, and turn left onto Snow Way. Walk on Snow Way; this will become Throop Drive. You will see the Knight Center on your right. You may enter Bauer Hall via the Knight Center. The Farrell Learning & Teaching Center is accessible via the Central West End MetroLink Station. Please see Google Map. Wheel chair accessibility to Holden Auditorium can be gained via the wheel chair access ramp located at the Scott Avenue East entrance to the Farrell Learning and Teaching Center (FLTC). The Scott Avenue entrance is located next to the Medical School shipping and receiving dock, on the east side of the FLTC. 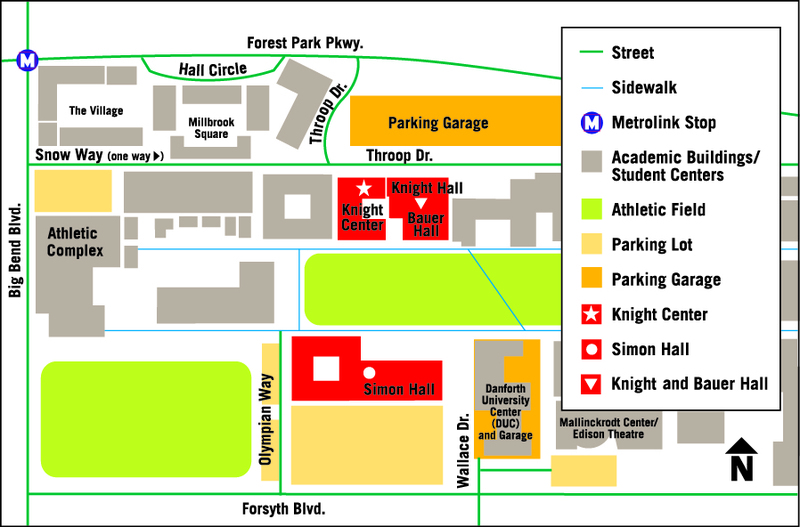 You may purchase a Parking Pass from the Knight Center/Olin Business School receptionist; the pass enables you to park in the Millbrook Garage, located on Throop Drive. You may also purchase a Day Pass from the Mallinkrodt Center, located next to the Danforth University Center (DUC). The Day Pass is valid for one day and allows you to park in Yellow Parking Zones. Visitor parking is also available in the Danforth University Center Garage. The charge is $1.00 per hour, with a maximum charge of $5.00 for the day. Payment will be required upon exiting the garage; cash and credit cards are accepted. Please note that daily visitor parking permits are not valid in the Danforth University Center Garage. Limited visitor parking is available on selected parking lots. The St. Louis City Treasurer’s Office maintains a few parking meters around campus as well. Usually the best option for WUSTL Medical Campus visitors will be to park on an hourly basis in either the Clayton or Metro Garages. 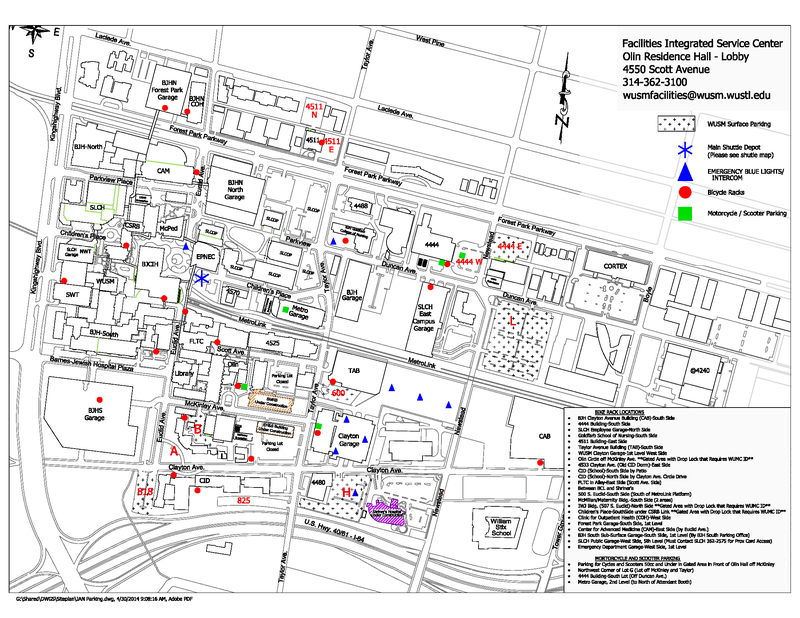 Please see WUSTL Medical Campus Map with parking indicated. Farrell Learning & Teaching Center (FLTC) is located at 520 South Euclid Avenue. Washington University in St. Louis will automatically void one parking violation (for no parking permit, incorrect zone, or overtime at meter only) per fiscal year, July 1-June 30 if it is the only ticket issued. Only tickets need not be paid; no further action is necessary. If any second ticket is issued during the year, the owner/operator is responsible for paying all violations.